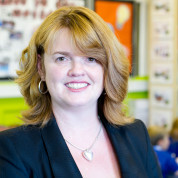 Janet has been the principal at two schools in Wales. She currently heads a primary school in a disadvantaged area of Cardiff. Due to her enthusiasm for engaging students through technology – in particular socially disadvantaged young boys can be hard to reach with traditional teaching methods – both her schools became ICT pathfinders and won several awards. At her present school there are eight screens in every classroom and the school is a test case for solar-powered computers. Janet has also set up a Lego Innovation studio that is shared between three schools and supports challenging STEM learning. Technology is used as a driver to engage learners in and between lessons, allowing them to collaborate and lead their own learning in a creative and ambitious way. Standards and attendance have steadily risen and student behaviour has improved. Since 2012 Janet chairs the National Digital Learning Council. In 2014 she received an OBE for Services to Education. Join the #TeachersMatter movement by sharing Janet Hayward’s update.